Review date: 5 July 2001. Sound enhancement gadgets do not have a distinguished pedigree. There have been quite a lot of them, over the years. Cunning little circuits that are meant to make little speakers close together sound bigger and further apart, or to make bass where little bass is to be found, or to "clarify" or "excite" or "sweeten" the sound from any number of sources. Until quite recently, they were all either modestly effective but massively over-promoted, genuinely useful but only in a professional studio situation, or rubbish. Today, though, you can get sound enhancement gadgets that actually work pretty well, for what they are. They're still often overenthusiastically advertised, but they're genuinely useful, and really sound quite impressive. By which I mean that hi-fi purists that hear what these gizmoes can do still don't want to own one, but they're surprised at how un-awful the effect is. There are two common kinds of audio enhancers. 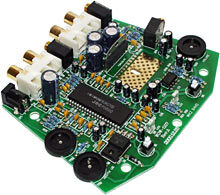 Stereo expanders aim to make your stereo sound stage sound wider. Bass enhancers aim to get more boom and bump out of speakers which, physically, just can't really do deep bass. Early attempts at stereo expansion usually created bizarre out-of-phase effects that gave listeners the impression that yes, those pokey little speakers did sound further apart, but only at the cost of making the listeners feel as if they had a nasty head cold blocking one Eustachian tube. Early attempts at bass enhancement were either simple frequency boosters - which are no good with little speakers, because it doesn't take much to make the poor little voice coils over-extend themselves - or more nasty analogue circuits that turned all of the bass into a vague amorphous rumble-slurry which could be effectively emulated by simply moving into premises located directly over an underground railway line. Things work better today because of research into why we hear things in the way that we do, and the resultant development of algorithms called Head Related Transfer Functions (HRTFs), which describes what happens to the frequency balance and phase angle of different sound components when the sound source is in different places relative to your ears. The shape of the ears and the sonic behaviour of the skull change sound quite drastically depending on where it's coming from, though you don't generally consciously notice that. If a fly buzzes toward your right ear, detours beneath your chair and then heads off towards the wall to your left, you don't perceive muffling of a fat band of frequencies as it passes beneath you and all sorts of phase distortions and wall-reflection artefacts as its position relative to you changes; you just perceive where the fly's gone, including the height information as well as the fore-and-aft and left-and-right data. Even if you've got your eyes shut. Using HRTFs and modern high-powered computing hardware, sound enhancement gadget makers can twiddle a plain stereo signal so that individual instruments in a band - for instance - sound as if they've each got their own location in space, with the whole ensemble sitting in the room with you, instead of on a stage in front of you. And makers of computer sound cards can implement 3D sound systems that let games position sounds in 3D space, so that bullet impacts all around you really do pretty much sound as if they're all around you, and passing noisy objects have a sound that follows the on-screen image in a plausible way. Bass enhancement has also taken leaps forward, with the arrival of digital signal processing hardware that's smart enough to selectively enhance low frequencies without redlining small speakers. So I was interested when I got my hands on a couple of digital sound enhancers, both based around SRS Technologies' audio twiddling hardware. Evergreen Technologies' RumbleFX 3D Sound Amplifier and 1388 Technology's Bit88 Universal Sound Enhancer both aim to do essentially the same thing - spruce up your sound - but they're actually rather different devices. At base, they both use SRS' "WOW" stereo expansion and bass enhancement and "TruBass" bass boosting technologies. Follow either of those links and you'll be able to view a select block of flack-speak and then click through to PDF brochure files which, if you print them, will automatically come out on the very finest of drool-proof paper. But, marketroid babble aside, SRS expansion really does remarkably expand the apparent stereo sound stage - though not necessarily in a way that everyone will like. And TruBass really does boost bass without just making everything sound as if you've cranked one tone knob all the way. The Evergreen product lets you play with the sound modification levels, while the 1388 Technology gadget is a plug-and-go, no-adjustments deal, with a guest appearance from a rather older kind of psychoacoustic manipulation. 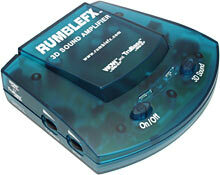 It's a close-run thing, but I think the RumbleFX 3D Sound Amplifier is actually the less flashy of these two. I probably only say that because I'm now so used to see-through iMac-ish techno-toys that they no longer make an impact. The 3D Sound Amplifier is about 35mm high by 130mm wide by 115mm deep, along its largest dimensions (1.4 by 5.1 by 4.5 inches), and it doesn't weigh much. That's because its power's supplied by a wall-wart plugpack. The plugpack the 3D Sound Amplifier came with was a small 15 volt unit, but the Amplifier will actually run from 12 volts as well - it just needs a 700mA-rated plugpack for 12V operation, versus only 500mA for 15V. 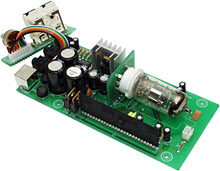 I mention this, because there doesn't seem to be a 220/240V version of the 3D Sound Amplifier. The one I got came with a 110/120V plugpack, which I ran from my little step-down transformer here in 240V Australia. If you're in some other country, though, and want to use the 3D Sound Amplifier, you won't have to buy a step-down transformer or find a 15 volt plugpack to suit it. An ordinary 12 volt one amp multi-plug wall-wart should do just fine. 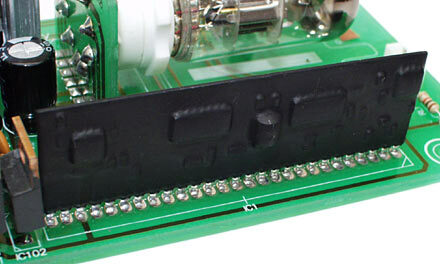 On the back of the 3D Sound Amplifier there are RCA and 1/8th inch connectors for both input and output. 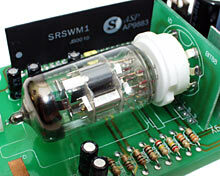 The 1/8th inch output is amplified and can drive speakers about as well as the average sound card speaker output. There's also a separate headphone output connector, and a volume control dial that affects the output level through every connector. You get a ten foot 1/8th to 1/8th inch cable with the RumbleFX unit - suitable for connecting it to a PC sound card output - and there's a 1/8th to 1/4 inch adapter as well, which lets you plug it into stereo equipment headphone outputs. On the opposite side of the RumbleFX Amplifier from the volume control and headphone jack, there are two dials, for the WOW and TruBass level. The lowest level possible still isn't zero, but if you want to listen to the unfiddled input, there's a separate "3D Sound" switch and light next to the power button on the front of the Amplifier. So you can turn off all of the processing if you like. Inside the RumbleFX unit there's this single circuit board, with an odd perforated spot in front of the amplifier IC that suggests a different chip might have originally been meant to be used. It's a clean board apart from that, though; no dodgy wire links or throw-solder-at-it-from-a-distance build quality here. The RumbleFX box has a Manufacturer's Suggested Retail Price or $US79.99, but if you buy it from the Evergreen on-line store here then you'll get an "Instant Rebate", which reduces the price to... $US79.99. Evergreen take pains to point out that only one Instant Rebate is available per household. I dunno; I think they could afford a couple more. Fortunately, the where-to-buy page here links to some better deals. From Beyond.com the Amplifier's $US58.99 at the moment; from Computers4SURE it's $US55.99. This is, I think, the winner of my inaugural Product That Looks Most Like A 3D Render Of Itself award. The Bit88, from the front at least, has the look of a preposterously expensive piece of tweak-gear aimed at the golden-eared audiophile lunatic market. Smooth silvery styling (it's only plastic, but the finish is good), logo, red power light. No power switch. No controls. Box, magic, sound, for the enhancement of, one. It's not very large, but it's bigger than the RumbleFX box - about 60mm high by 85mm wide by 190mm deep (2.4 by 3.3 by 7.5 inches). The back of the Bit88 spoils the illusion. You get both RCA sockets and 1/8th inch stereo connectors for both input and output - though you're sternly warned not to use both flavours of input simultaneously. The 1/8th inch output isn't amplified; if you connect it to computer speakers, they'll need to be the amplified kind. There's also a 1/8th inch stereo headphone socket, with a volume control which only affects the headphone level. The Bit88 should be capable of driving very high impedance, very low efficiency headphones with ease; it can play loud through normal 'phones. Full volume on the RumbleFX gadget's headphone output, from line level input, is pretty much headache level on my ordinary-sensitivity Sennheiser 'phones - but the volume increase starts to plateau out as you advance the control, which is indicative of a little op-amp somewhere running out of puff. About one-third volume on the Bit88 matches the loudest headphone output the RumbleFX box can manage, and there's no sign of a plateau over most of the rest of the volume range. I didn't test all of the volume range, lest I damage the drivers in my Sennheisers and push my sinuses out of my nose. There are no audio cables included with the Bit88; it's a BYO-wire product. After hooking it up, I discovered that the RCA outputs of my Bit88 - and, presumably, other ones too - were reversed. The left output delivers the right channel, and vice versa. Fortunately, this is very easy to fix - you just swap the plugs over. No drama. Fixing this problem for the 1/8th inch connectors wouldn't be as easy (you'd have to use a custom-wired cable, or a couple of 1/8th-to-RCA Y-cables and joiners), but that output was the right way around. So this qualifies only as a quirk, not a problem. Apart from the headphone volume knob, the Bit88 has no other controls. No level controls, and no power switch. You get one and only one effect level, and when it's plugged into its power supply, it's on. The power supply, once again, deserves separate comment. The Bit88 comes from Singapore, which is a 230V country, and its power adapter can be used in any 220/240V country (local electrical approval regulations permitting). The power supply I got came with a big fat UK-style plug-with-a-fuse on the end of the mains lead, which I replaced with an Australian slant-pin plug. There's apparently no way to order a Bit88 with a different plug. If the plug doesn't suit your country's wall sockets, you'll either have to replace it as I did, or get a "travel adapter" to suit. If you're in a 110/120V country, the Bit88's power adapter won't work from your mains power. You can't just buy an off-the-shelf adapter to replace it, as it's a triple-output 14.5+14.5+5.5V unit with 500mA ratings for the two 14.5 volt outputs and a 1.5A rating for the 5.5V one. The power connector on the Bit88 is an off-the-shelf mini-DIN plug, so an electronics enthusiast could no doubt knock together a power supply that'd work. But it'd be much simpler to just buy a low power (50 watts would be plenty) step-up transformer and plug the standard power supply into that. Why go to all that trouble just for an SRS gadget? Well, the big deal about the Bit88 isn't its permanently-on SRS expansion and TruBass. The big deal becomes obvious once you take the lid off. ...one darn great valve, sitting right next to the roughly-90-years-more-modern SRS hardware. Many audiophiles, and many musicians, like valves. Valves run hot and wear out and are sensitive to vibration and cost a lot more than transistors with similar amplification capabilities, which is why you don't see a whole lot of valves in modern electronics. But valves have one big advantage. When you use them in audio amplifiers, they distort the sound in a nice way. The "valve sound" is not instantly obvious when you're listening to an amplifier run "clean", well below the level where clipping happens. Clipping is what you get when the hardware's being pushed to deliver more volts than it can actually physically manage. Once you do ask that much of an amplifier, the distortion you get from valves is composed of even harmonics, which sound tuneful and pleasant compared with the odd-harmonic distortion you get from transistors. This is how, classically, you get an overdriven electric guitar sound. The difference between valve and transistor distortion in this situation is something that any cloth-eared git should be able to hear. At non-overdriven levels, valves and transistors sound a lot more similar, but the valves still inject their even-harmonic extras into the sound. And a lot of people really like the difference. Which is why there's still a market for tube hi-fi amplifiers. It's now possible to buy amplifiers and effects pedals that use digital signal processing hardware to emulate the valve sound for musicians, and there's no reason why a similar trick couldn't be done for hi-fi gear. But lots of people still prefer the original. Hence, in the Bit88, a valve. What you're looking at here is a 6DJ8/6922/ECC88 type high transconductance double triode in a 9 pin miniature package (well, miniature by valve standards, anyway). This is a low noise stereo pre-amplifier valve; there are umpteen different versions of it made by various different companies, about the relative merits of which valve fans have interminable arguments. This sort of valve shows up in scads of valve pre-amps. Because the 6DJ8 isn't a power amplifier valve - it has only enough output grunt to boost signals to line level, basically, and can't drive a speaker - it doesn't take a lot of power to run it. And it ought to last well, too; valve life depends on many factors besides the quality of the valve itself, but there's general agreement that as long as the surrounding electronics don't mistreat it, a 6DJA should give at least 5000 hours of quality service before it starts to "whistle" noticeably, necessitating a replacement. A new 6DJ8 will cost from $US5 to $US50, depending on the manufacturer. A 6DJ8 can last for tens of thousands of hours, though; higher numbers should be likely in the Bit88, because it's apparently not running the valve anywhere near its maximum power. So yes, it wears out. But it ought to last a heck of a lot longer than a lightbulb. Mind you, I still think it's a bit cheeky of 1388 Technology not to include a power switch on the Bit88. Even if the valve lasts for the three to five years they claim - or the at least five years they claim elsewhere - that's still up around the plausible life span of the electrolytic capacitors that stud the Bit88 board. Four years is more than 35,000 hours, and sitting next to a nice warm valve does not lengthen the life of an electro. Turning valve gear on and off shortens the valve's life, but if you use the Bit88 for, say, two hours a day, you'll wear it out faster by leaving it on for the remaining 22 hours than by turning it off when it's not in use. Of course, you can turn the Bit88 off perfectly well by just yanking out its power connection. Here's the SRS hardware package in the Bit88 - it's all mounted and mummified on this pin-edged block. 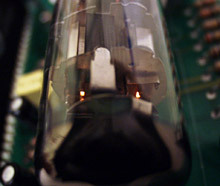 And here, in case you care, are the tiny heaters inside the valve, glowing away with the Bit88 powered up. This gadget likes to have a little ventilation around it, even if it does only have one, low powered valve to keep cool. The Bit88 sells for 193 Singapore dollars, which includes shipping within Singapore. If you buy from the Bit88 site, you can get it shipped internationally; it's S$20 for shipping within Asia, S$30 for elsewhere. 193 Singapore dollars is about 106 US dollars as I write this, or about 205 of the funny little squishy dollars we use here in Australia. So the Bit88's noticeably more expensive than the RumbleFX processor. What's it sound like, then? First, a basic point. If you've got nasty little speakers sitting quite close to each other - as many computer users do - then SRS expansion and bass enhancement will make them sound better. It will not make them sound good, compared with any sort of half-decent real stereo system, but it will indubitably help. The same applies to 'orrible little midi-system speakers hanging off the side of their middle component box, and to any kind of built-in-speakers boom box. It may be difficult or impossible to connect an SRS processor in these latter cases, but if you can, it'll help. Better cheap computer speaker systems - the ubiquitous two-satellites-and-a-little-subwoofer setups - also benefit considerably from SRS twiddling. Again, the closer the satellites are to each other, the more impressive will be the difference when you expand 'em the SRS way. If you use headphones to listen to your computer sound, SRS expansion's not as terrific. Headphones, by definition, give you excellent stereo separation all the time. And it's not difficult to get headphones with a decently flat, and impressively wide, frequency response. In this case, SRS expansion will still create a dramatic effect, and SRS bass boost will still be very noticeable, but it's a matter of taste - and of tolerance, too. Stereo expansion that sounds spectacular for the first minute may be annoying after an hour. The brain does a heck of a lot of processing of everything that comes down the auditory nerves, and your perception of a particular effect can change drastically over time. If you're playing computer games, stereo expansion can do as much for background music as it can do for any other kind of music, and it can punch up the impressiveness of plain stereo sound effects no end. And there's nothing wrong with bass enhancement for games, either. But if you're using a sound card that can do positional audio, and you're playing a game that supports it, then your sound card will already be doing all sorts of fancy HRTF tricks. Adding more psychoacoustic fiddling after the fact will probably not help the effect. Bass boost may still be fine, but expansion probably won't - it'll exaggerate a few effects and muck up various others. If you've got a multi-speaker setup with more than one stereo pair, then neither of these gadgets will be able to enhance all of the speakers. One stereo pair only, folks, unless you buy more SRS processors. Evergreen Technologies make all sorts of marketing claims about the 3D Sound Amplifier, but the presence of the "3D Sound" switch makes it pretty clear that they don't expect you to love what it does to everything. If you don't care for 3D sound in some situation or other, it's easy to turn it off. 1388 Technology, on the other hand, say that the Bit88 will without exception make everything sound better. Which could just be more marketing-speak, but the absence of a bypass button means they're putting their money where their mouths are. Too see if 1388's bet was justified, I tried out both processors on various sources, starting with music. Starting with rather old music, in fact. Glenn Gould's classic 1955 recording of J.S. Bach's Goldberg Variations sounded lousy through either processor. This recording is mono, to start with. Both processors say they can make mono into tasty stereo; if you ask me, no mono-to-stereo gizmo is worth bothering with. The actual sound quality of this recording's not that great, either. This is at least partly because of Gould's famous propensity for humming along with the music - well, it's mainly humming - which hapless recording engineers and other technical genuises tried to minimise throughout this oddball pianist's life, but which is very much still audible in the background of this 46-year-old recording. What does SRS pull out of this recording? The fine nuances of Gould's performance, perhaps? The ambience of the recording environment? The very essence of Bach's brilliance? SRS emphasises the background Gould-isms. Suddenly he sounds as if he's got stereo asthma, with both background noise and tape hiss emphasised and expanded, while the piano stays pretty much in mono. I don't find the noises on this disc especially annoying - it's not as if it's some noise-storm shellac-disc ancient blues recording. But that doesn't mean I want the noises emphasised. So in this situation, the Bit88's annoying. All it needs is a simple "defeat" button, like the 3D Sound switch on the RumbleFX amplifier, and you could remove it from the equation whenever its talents turn out not to suit the source material. But if you want to do that with the Bit88, you'll need to do it externally. Wiring the Bit88 in to the "External Adapter" connection that some fancier pre-amps have would do the trick, as would setting it up as a tape deck as far as the pre-amp was concerned. But in a computer audio setup, or any other rig that lacks a bells-and-whistles pre-amp, you'll either need an external switch box or some plug-juggling to get rid of the Bit88. James Brown's Live at the Apollo is another not-so-new recording - 1967, to be exact - but at least it's in stereo. Rolling the RumbleFX processor's WOW wheel back and forth while listening to this disc through headphones gave me the classic SRS soundstage immersion effect - as if you're moving in among the musicians when WOW's turned up, and moving back towards the normal audience location when it's turned down. This isn't exactly what it sounds like, though. Because WOW enhances any stereo it finds, any singer with a bit of stereo reverb on their voice - like the Godfather's backing singers, on the Apollo disc - end up sounding as if they're further away (but no quieter) when you turn up the expansion. The reverb gets boosted more than the voice itself. Combined with some HRTF height-cuing of higher frequencies (which puts the horn section a little higher up, and the backing singers a lot higher up, when you dial up lots of expansion), the effect is a bit like what might happen if you opened a door in the front of the stage and crawled in under the band. I started to get a feel for the difference between the two processors now. The Bit88 has a clearly "warmer" sound, with more midrange and mid-bass and, oddly, more bass boost than the RumbleFX processor manages. The RumbleFX box's TruBass control seems to give you a range from "very little" to "noticeably more", but that's about it. Which is strange. Traditionally, sound processing gadgets with level controls give the user an adjustment range that starts at not-much and goes to far-too-much. That's pretty much what the RumbleFX processor does for the WOW expansion effect; at maximum power, the WOW level from the RumbleFX processor is obviously too high on widely spaced speakers, or headphones. Small close-together speakers, though - like the ones that come built into some monitors, or the ones in boom boxes - can benefit from very high expansion settings, especially in non-critical environments like parties and trade shows where you just want a great big lowest-common-denominator-pleasing sound and do not give one half of a tinker's cuss whether anybody can point to the first violin and name the colour of his bow tie. 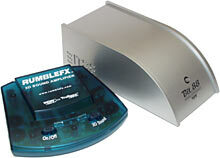 But even at its maximum setting the RumbleFX box's bass boost was quite modest. Obviously audible, but it could have stood to be rather higher. Trundling further forward through the years, I tried a little-known 1975 album by an English band named after two Georgia jazz musicians, or two Carolina blues musicians, or two Martian iguanas, depending on who you ask. Seventies Floyd is, somewhat stereotypically, music to be listened to when you're, ah, hearing things differently. So it's a good candidate for stereo expansion system testing. Through the Bit88, the whole of Wish You Were Here sounds rather nice. Nothing goes weird (well, not any weirder than it is to start with), no lyrics get eaten by the rest of the mix, and the warm, expanded, bass-pumped Bit88 sound suits the music really well, if you ask me. The RumbleFX processor was fun with this disc, too. Its inferior bass response was noticeable once again, but winding the SRS expansion up, even all the way to the maximum setting, created a surprisingly listenable effect. Super-expansion may generally be a bad idea, especially for headphone listening - but if you want to lose yourself in a Floyd soundscape, then there's something to be said for it. If you administered an ordinary aspirin tablet to an unsuspecting friend and then steadily turned up the SRS expansion on a hidden RumbleFX processor over the next ten minutes, your friend would be likely to surmise that the pill was doing something rather entertaining. Changing tack a little, I attempted to damage some circuitry with AC/DC Live. This is a very professionally produced live recording, with none of the mix oddities and nasty noises that can pop up in more "authentic" live albums. It's also, just in case you're not familiar with this particular Australian product, not really chamber music. The Bit88 sounded OK with Acka-Dacka doing their distinctively monotonous thing. More bass - nice. A bit of expansion - all right. Hard-to-quantify tubey warmness - frankly, I couldn't hear it in all the racket. The RumbleFX wasn't so hot. Not enough bass, essentially. The more expansion I dialed up, the more Brian Johnson's centre-stage screaming (which, since it's essentially mono, doesn't get expanded much) got swamped by the guitars. A bit of expansion was OK, but I much preferred the Bit88's sound. Switching from vindaloo to sorbet, I tried my favourite version of Vivaldi's Four Seasons, by the Connecticut Early Music Festival Ensemble. It's a clean recording of a small original-instrumentation classical group, with lots of clear stereo positioning cues. For this disc, I preferred the RumbleFX processor to the Bit88. But I didn't think either of them improved the music much. They both changed it plenty, of course, but the moderate RumbleFX bass boost and a small amount of expansion managed to fill the sound out without fuzzing it hopelessly. The Bit88 didn't sound awful, but it did more expansion than I wanted to hear. This is just a matter of taste, of course, and whether you'd like it or not depends on your own taste and your speakers and/or headphones. Through my nice headphones and through my big speakers, though, frankly, I could take or leave SRS expansion entirely for this sort of music. And I'd really have liked to have been able to turn the Bit88's effect down a tad. Enough of the light classical. Thud and blunder time. Namely, Carlo Curley getting full value out of every ton of a pipe organ in Philadelphia. Which, for reference, isn't quite as monstrous as certain six hundred freakin' horsepower behemoths with so many pipes that nobody actually knows exactly how many there are. It didn't entirely surprise me to discover that Carlo's an official Patron of the Society raising money to restore that leviathan. But even the littler organ that Carlo plays on the recording I used is more than capable of converting the average hall full of peasants to the religion of your choice. The Curley track I picked was, naturally, That Big Loud Organ Piece That Everybody Knows, J.S. Bach's Toccata and Fugue in D Minor. This is one of my standard floorboard-motion-inducement test pieces, and the RumbleFX processor did fairly amusing things to it. With the WOW dial wound up all the way it sounded as if you'd walked into a maintenance chamber behind the organ pipes, but at a more modest level the expansion was pleasing enough, and the TruBass boost didn't hurt either. The Bit88, though, did a better job. Its expansion's set at a good level to suit the airy concert-hall sound, its bass boost is tasty with this sort of source material, and the whole piece sounded exactly as overblown as it ought to. It wasn't all good. The CD this rendition of the T&F is on ("The Emperor's Fanfare", Argo 430 200-2) is alleged to be an all-digital "DDD" recording, but there's lots of hiss and rumble, and SRS expansion brings it out clearly in the quiet passages. In the loud passages, there's a bit of a Voice Of God thing going on, and that kind of swamps the other stuff. But SRS expansion really is a bit annoying when there's any sort of stereo hiss in the signal. On to something with some (relatively) normal vocals in it; Tori Amos' "Little Earthquakes". The album before she started going weird just for the sake of it. Track 8, "Leather", has both sparse piano-and-voice sections and big-orchestral-backing parts. Piano-and-voice music often gets mauled badly by any drastic sound processing. The RumbleFX processor's bass boost didn't hurt this track, and its expansion was OK. The Bit88 sounded a bit better, to my ears; maybe if it was just the bass boost. If it wasn't, then perhaps it was valvey warmness. If it wasn't that, then it could easily have been me fooling myself that the prettier and more expensive box sounded better than the cheesier and cheaper one. This wasn't a level-matched double-blind proper listening test, after all. It was just me swapping my headphone plug from one box to the other. Anything that tempts an audio product reviewer to start inventing abstract philosophical terms to describe the behaviour of a component, because there's nothing very clear changing, has a good chance of not actually existing. If you want to read people's unscientific psychoacoustic observations about audio componentry that they say makes the sound more "vibrant", "detailed", "transparent", "musical" or "airy", they're not hard to find. Anyhow, I quite liked what the Bit88 did to Tori. I then spent a few hours listening to ordinary TV through the processors. Normal TV shows with SRS expansion, though headphones or a quality speaker system, give the impression that everything's been miked a bit too closely. Advertisements in particular - they've already got soundtracks that are tweaked to bursting to make them as noticeable as possible, and they don't need even more fizz and rumble. If you're listening to little TV speakers, SRS twiddling once again does more good than harm, overall. But otherwise, deep-voiced newsreaders sound as if they've swallowed their lapel mike, and the preternatural clarity of every sound effect in every single advertisement starts to grate pretty quickly. Watching movies with SRS expansion's another matter. It's not a substitute for a proper surround setup or a surround decoder for headphones, but it's certainly impressive. The more sweeping orchestral crescendoes and thunderous explosions there are in the soundtrack, the more spectacular SRS boosting will sound, and it generally won't be at the expense of the dialogue. On the minus side, SRS-twiddled movies can provide a great example of the listener-fatigue problem. "Titanic" happened to be on TV, and I plugged my headphones into the Bit88 and watched the movie. Long before Leonardo Dicaprio had the decency to finally freeze to death, I was wishing things would close up, quiet down and move away, just a little bit. If the Bit88 had an effect-level dial then I could have made them do just that, but whaddaya know, it doesn't. For computer games without positional audio, 3D expansion is great if you've got lousy speakers, but can be a bit much with headphones, if you ask me. Computer game stereo audio tends to be pretty enthusiastically twiddled-with in the first place, and I'm not sure if I want it any wider. Low expansion settings on the RumbleFX sounded OK; the Bit88 was a bit more expansion than I liked. For computer games with positional audio, as mentioned above, these processors tend to spoil the effect by HRTF-ifying sound that's already been HRTF-ified. SRS have their own hardware stereo-expander box, the "WOW Thing", which does WOW and TruBass and which sells for a mere $US24.95 or $US29.95, depending on whether you buy the original blue version or the funkier clear one with extra cables for connection to game consoles. 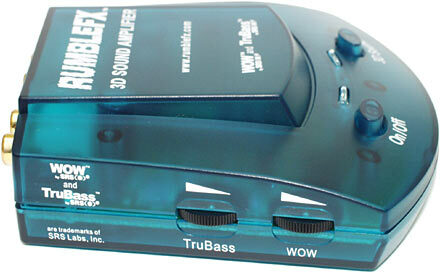 The WOW Thing has individual dials for WOW and TruBass, like the RumbleFX box. It's only got 1/8th inch connectors and a headphone output, with no amplified output, but you can't complain for the price. SRS also used to have a downloadable software WOW and TruBass Winamp plugin, which was nagware for a while, then became free to register around the time that Microsoft included SRS expansion in Windows Media Player 7. SRS in software sounds much the same as SRS hardware, at lower expansion levels; there's a little sound quality loss, but if you don't go nuts with the level controls, it's definitely worth what you pay. Neither of these gizmoes gets my total recommendation. The RumbleFX 3D Sound Amplifier does great things for lousy sound systems, but it's got a strangely subtle bass boost, and it costs a lot compared with the similar gadget made by the inventors of the SRS technology. The Bit88 sounds, generally, nicer than the RumbleFX, I think. But that doesn't mean it sounds better all the time, and there's no elegant way to disable the darn thing. If the Bit88 had a "defeat" button - or, better yet, separate on/off buttons for the valve pre-amp and the SRS gear, and perhaps a level dial for the expansion, at least - then it'd be a clear winner over the RumbleFX, as long as you didn't mind its price. If you're thinking about buying one of these gadgets, I suggest you preview SRS expansion using the Windows Media Player plug-in, or in an audition at a computer store, so you know what you're paying for. 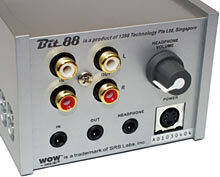 Listening tests with the Bit88 would be nice, too, given its non-trivial purchase price. The bottom line, though, is that neither of these products is snake oil. Consumer market sound expanders used to be rubbish; now they're not. But they're still not as great as the makers want you to think. 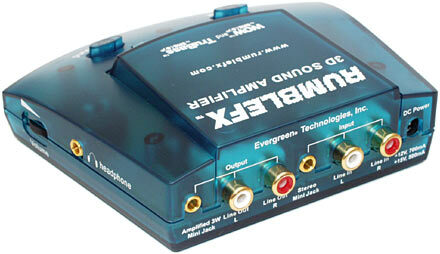 RumbleFX 3D Sound Amplifier kindly provided by by Evergreen Technologies. 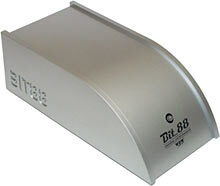 Bit88 Universal Sound Enhancer kindly provided by 1388 Technology.